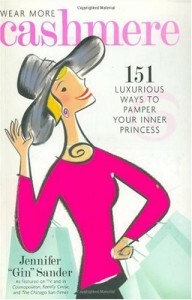 I love reading books that are fun, girly and give great advise. I was looking through my library last week trying to decide on a great book to take on the plane to Las Vegas. I already had my business books packed and knew I needed just a little self improvement/beauty book to keep it simple and fun. I came across and forgot I had this fabulous book “Wear More Cashmere” by Jennifer “Gin” Sander. If you were keeping up with my Facebook page www.facebook.com/freshbeautystudio you will see my post “I just ordered a “Niktini” so delish. What is a Niktini you ask? Well, my signature drink of course! A little tip from this girly book. It’s a small indulgence to name a drink after yourself and unique. This book gives you great advise on 151 luxurious ways to pamper your inner princess. It’s all about creating a more glamorous world for yourself. Girls you are worth it, hold your head high and walk into that presentation, date, lounge with 100% confidence.